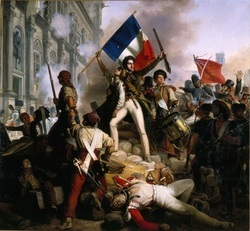 Similar to nationalism, the French Revolution was a major component in the spread of nation states across Europe. The French Revolution represents a violent approach to the formation of nation states, but there are other ways. Many island nations such as Japan and Great Britain naturally became nation states because of their easily defined physical borders. However, it wasn't until the French Revolution that nation states became widespread across mainland Europe. The spread of nation states was directly impacted by the spread of popular French nationalism. It was through this notion of national pride that different states began to function with increased unity and strength. Rather than borders being defined merely by physical barriers, nation states began to draw lines of distinction based on people. This allowed for the better allocation of resources and increased national unity. Later in France's history, Napoleon Bonaparte was a vital component in the development of the nation-state. Amid the chaos of the French Revolution in the late eighteenth 1700's, most remaining medieval and feudal laws were overturned and a truly national law code was put in place. A national military was created. Furthermore, France’s status as a nation-state was a key factor in its ability to dominate feudal neighbors in Italy and Germany. Napoleon’s military victories also paved the way for the emergence of nation-states in the rest of Europe, simply because Napoleon himself became a common enemy and figure of unity for the masses.